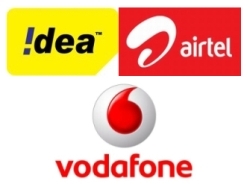 Bharti Airtel, Vodafone and Idea will now share their networks with each other through inter and intra-circle roaming agreements to provide 3G services to their respective customers across India. When the auction for the 3G spectrum had taken place, Airtel ended up getting 3G spectrum licenses for 13 circles while Vodafone and Idea got them for 9 and 11 respectively, but none of them got licenses for all 22 circles. This agreement between the three telcos will allow each of them to have a pan India presence and that too at reduced costs. The financial details of the revenue share agreement were not disclosed. While Vodafone acquired 3G spectrum in 9 circles including Delhi, Mumbai, Maharashtra, Gujarat, Tamil Nadu, Kolkata, Haryana, UP (E) and West Bengal. ICR agreements have become very popular amongst telco's these days. Vodafone made an Intra Circle Roaming (ICR) arrangement with Idea Kerala to provide its subscribers in the southern state with 3G services. The company is also planning to launch their 3G services through a deal with Bharti Airtel. Idea in turn launched its 3G services in Delhi and Kolkata through a similar agreement with Vodafone which has licenses for both the metro cities. Similarly, Bharti Airtel has also entered into intra-circle roaming agreements to share Idea's 3G etwork in Gujarat and could further partner with Idea to provide its 3G services in the state of Karnataka. 3G mobile services have already crossed the 9 million user mark in India and the number could go up to 100 million 3G connections by 2015, hence it's only a matter of time before other big players like Reliance, Tata and Aircel make similar deals to increase their 3G presence in the country. Our take: This is an interesting way to offer pan India 3G services to all customers without paying for the spectrum charge to do so in all the circles. It surely works in favour of telecom companies, their shareholders and possibly subscribers(hopefully they won't face slow network due to the agreement). But one may smell some oligopolistic activity here that could have possibly led to loss of revenues for the exchequer (the Government) as the only other way all these telcos could have offered seamless 3G services to their consumers across India was by bidding for all the circles separately and thereby raising its price!